Did Zane Grothe Just Revive American Men’s Distance Swimming? By Jason Tillotson, Swimming World College Intern. Zane Grothe may be on his way to filling the void the American men currently have in the 400m and 1500m freestyle. The only factor in deciding if Grothe is responsible for a revival of the distance events is if he can translate his record-breaking yards swims into medal-worthy long course performances. Not to say that American men’s distance swimming was necessarily dead, but it was at least incapacitated. The U.S. just has not had historical dominance in the distance freestyle events at the Olympics or in the world record progression. The last American male to win the 400m freestyle at the Olympic Games was George DiCarlo in the 1984 Los Angeles games. The American men did win the bronze in every games from 2000-2012, but failed to medal in Rio. The same emptiness on the medal stand is seen in the 1500m freestyle as well. Mike O’Brien was the last American male to win the gold in the event when he did so in the ’84 games. The Americans had small pockets of success with Chris Thompson’s bronze in 2000, Larsen Jensen’s silver in 2004 and Connor Jaeger’s silver in 2016, but there is no consistent American dominance in the distance events like there is in other events such as the American backstroke dynasty, Ed Moses‘ and Brendan Hansen’s reign in the breaststroke, Michael Phelps‘ stranglehold on the butterfly and Ryan Lochte’s I.M. expertise. Not to mention the American men’s consistent global presence in the sprint freestyle events. In other words, the U.S. has no Phelps to be used as a go-to guarantee for a medal or a world record in the distance freestyle events. In terms of the world record progression of the distance events, the American men have been absent from that list for a long while. Brian Goodell was the last American man to own the world record in both the 400m and the 1500m. Goodell owned the 400m distance in 1978, and the 1500m in ’76. Since FINA began recognizing short course-meters records, the American men have literally never held the world record in either distance in the SCM pool. The American men have held the U.S. Open records in the yards versions of the distance freestyle events for quite some time and the amount of sub-4:10 and sub-14:30 500 and 1,650 freestyles turned in by an American have exponentially increased in the past decade. With all that information, why don’t the Americans have more success in these races in long course meters? The answer may not be clear but the evidence for the claim is apparent. After Clark Smith’s impressive yards performances at last year’s NCAA championships, many thought he would help USA’s appearance on the medal stand at the World Championships in Budapest, but failed to medal in the 400m distance and didn’t even swim the 1500m race. Grothe’s new American records may or may not translate into long course success, but even if they do not, he may still be responsible for taking American distance swimming to a new level. With Grothe being the first to reach two major milestones (under 4:08 in the 500 and under 14:20 in the 1,650) we could very well see many more swimmers get under those milestones at this year’s NCAA’s. The more swimmers who go under 4:08 and 14:20 in the 500 and 1,650, and the more regular going under those times become, the more likely we were are to have at least one of those swimmers translate a world-class yards performance into long course meters and increase the American’s relevance in distance freestyle swimming. No matter what happens at NCAA’s or later in the season doesn’t matter as much as the fact that the American men have another chance to get themselves back into the distance freestyle game. Will Zane Grothe, or any other American man, transmute their yards performances into long course success? No, I don’t think so. I believe the revival started back with Larsen Jensen. I feel it picked up some momentum with Clark Smith the past couple years. 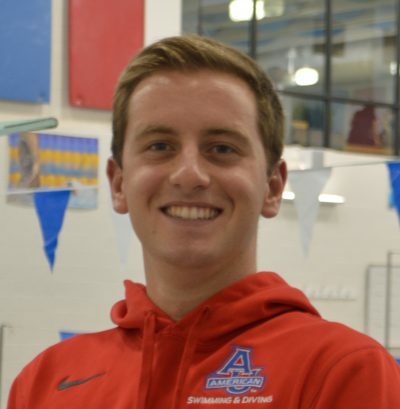 Now Zane Grothe is another swimmer helping to push American distance swimming forward. Are there yards pools anywhere in ignoring numbers outside of the US? That would explain the US men holding those records, unless there are International swimmers based in the US and not swimming in LC50m pools. Maybe it is a typo, but Goodell held the 400 record in 1976 set at both the Olympic Trials and the Olympic finals in Montreal. The same year he worked the same magic in the 1,500 as well.